The Riviera Maya in Mexico is the coastline ranging from Cancun in the North down to Tulum in the South on the Caribbbean side of the Yucatan Peninsula of Mexico. Weather is moderately tropical with high humidity and lowest temperatures of 18° Celsius (65° F) in winter and about 36° C (100 °F) in summer. Nights in winter can be quite chilly. Playa del Carmen is situated in the tropical hurricane belt which could mean tropical storms in the period from June to October. Quintana Roo has changed to Eastern Standard Time or GMT -5h and do not change into daylight saving time anymore. Electricity is delivered at 110 Volt and the international country code for calling from abroad is +52 followed by a 9 digit number for landlines and 10 digits for cell phones. Besides diving one can find old Mayan culture as well as gorgeous towns from the times of the Spaniards colonising the Yucatan Peninsula in close neighbourhood to unspoiled nature. All this sets a contrast to the well-known picture of the Caribbean. 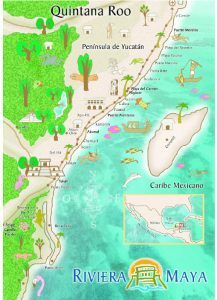 Please let me know how I can assist with any further information about the Riviera Maya, Playa del Carmen, your soon-to-be holiday destination.